But there are also circumstances where these actions don’t help. Let’s start with the easiest and fastest way of solving a problem on an iOS device. To reboot means to discard all continuity in a running device in order to recreate its status and memory from the beginning. Why do you have to reboot your device occasionally? Rebooting is sometimes necessary to recover from an error, re-initialize drivers, or hardware devices. A reboot may also occur automatically if the computer or hardware device encounters an error or is overloaded. The reason can be a hardware malfunctioning or, more likely, an application which does not manage the memory associated to it correctly by interfering with other parts of the memory reserved for other tasks. You want to send money to an a count and looked up the account number. Somebody asks you ‘What time do we have the appointment with Mr. Smith?’. After answering, your short-term memory containing the account number is deleted or the account number you are sure it’s right now contains transposed digits. You have to reboot and load your memory again with the account number. If you don’t look up the account number again your money transfer will fail. Regarding your device an app may execute an unwanted operation which might freeze it e.g. by running into an endless loop. You tap on a control but the app doesn’t react or delivers wrong information to the brain of your device, the processor. In some circumstances, though, the problems are more extensive and require putting the device into recovery mode and restoring it. Recovery mode is also called DFU mode (Device Firmware Update). DFU Mode is a state where an iOS device can interface with iTunes but does not load the iPhone operating system or boot loader (this is what really differs DFU mode from Recovery Mode). The primary reason people need to access DFU mode on their iOS device is to change the firmware on the device. This can serve to downgrade to a prior iOS firmware and operating system, or to use a custom firmware that is required for a Jailbreak or SIM unlock. 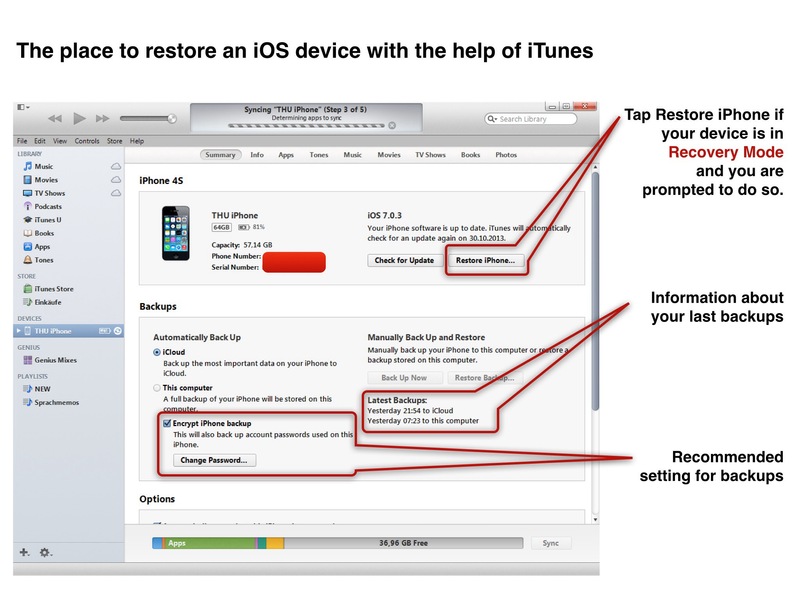 You may need to perform a recovery-mode restore if you experience any of the following situations on your iOS device. This brief manual applies to all iOS devices as there are iPhone, iPod touch, and iPad independent of their iOS version. I kept it brief and left out the clear-worded instructions messaged from iTunes and your device. They are all self-explaining. To use an iTunes backup password is highly recommended because only in this case the device restore includes all sensitive data like passwords for E-Mail accounts or websites. Connect Apple’s USB adapter (cable for charging your device) to your computer with an installed version of iTunes, but do not connect it to your iOS device. Turn off your iOS device by holding down the Sleep/Wake button in the top right corner until the slider ‘Slide to power off’ appears at the top. Slide it. If your phone won’t respond to that, hold the Sleep/Wake button and the Home button together until the screen goes dark. When the phone is off, hold down the Home button and connect the USB adapter to the dock connector of your iOS device. The iPhone will turn on and display the Apple logo. Keep holding the Home button until the screen shows the iTunes logo/USB adapter. The iOS device now is in Recovery Mode. If the red empty battery icon appears onscreen, let the phone charge for a few minutes and then restart this process. 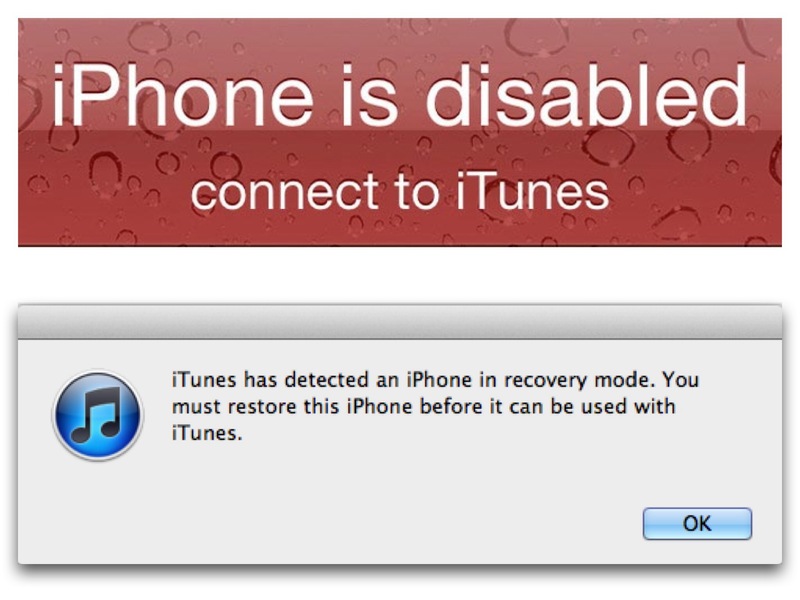 When the phone is in recovery mode, a window will pop up in iTunes saying that the phone is in recovery mode and needs to be restored. You can either restore it to its factory settings or from a recent backup of your data. I set my iPad 3 (64 GB, Used space 21.5 GB, 224 apps) into recovery mode after backing up to iTunes. The total time of a restore was about 3 hours. About 20 of the 224 apps are frequently used and a greater amount of data is stored in their local folders. The other apps are just for tests and usually manage no data. You can estimate the time for the total recovery process including the restore of data by taking the two parameters (21.5 GB and 180 min) into account. If recovery is not possible you have to contact an Apple Store or send your device to the repair service. f you don’t have any backup in iTunes or iCloud resp. just an old one you will loose all your data resp. all changes since your last backup. If the iOS device has been disabled from too many attempts at entering the passcode lock, then your device will be locked. The only way to regain full use is to put the device into recovery mode and restore it via iTunes. So in this case you must have access to a computer with an installed version of iTunes. There is no way to do it just with an internet connection. If you don’t use iTunes, maybe you already moved into the Post-PC era, you can restore your device if it’s connected to a WiFi network. 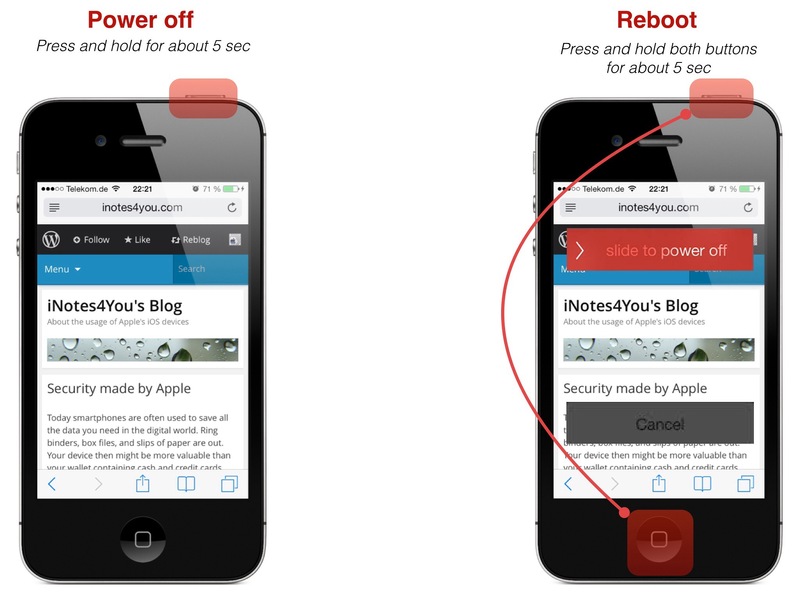 An iOS device has a built in reset option programmed into the device itself. With the introduction of the iCloud service, you no longer need to connect the device to a computer to restore through the iTunes software. Restoring an iPhone is useful if you’re going to sell the device or if you want to troubleshoot it after data has been corrupted. Connect to the Internet through a Wi-Fi connection. A typical iPhone backup can consume a lot of data. Tap on the button that says “Back Up Now” to cause the iPhone to back up its settings to iCloud, which may take several minutes to an hour or more. Tap the button that says “Erase All Content and Settings.” The iPhone will ask you to confirm this choice. Press the button marked “Erase Phone” to restore your phone to its factory settings. Start up your iPhone. On a freshly restored iPhone, you are prompted to use the Setup Assistant. Do this in a place where the iPhone is connected to a Wi-Fi signal. This can consume a lot of data. Enter your iCloud username and password information. Your iPhone will restart and begin downloading your backup from iCloud. You may be asked to choose from up to three backups on iCloud, sorted by date. If you wish to recover all your settings and data again on a new device, ensure that you have an iCloud or iTunes backup and that it’s up to date. 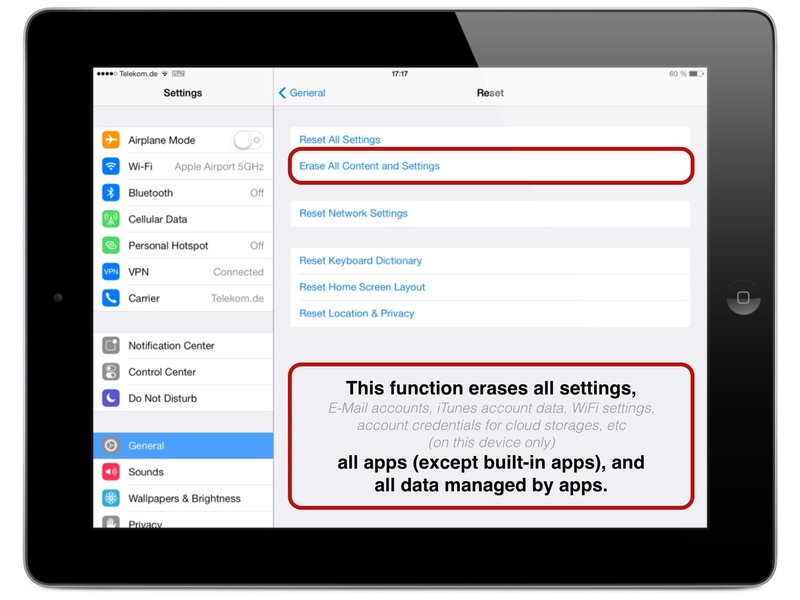 Restore from a backup or even recovery of a device is usually a process you didn’t need while using your iOS device. Quality of hardware and software ensures that all what happens in the life of a computer doesn’t happen with an iPhone or an iPad. Anyway your iOS device should regularly backed up to iTunes, or what is much more comfortable, to iCloud. Strongly recommended is the usage of an unlock code as well as a password for iTunes backups. If you don’t use passwords many sensitive settings like E-Mail account settings are not included in a backup. So you have to configure them all if the restore process is finished. That can be a pretty much exhausting task.